Sorcery, an arcane mystical power wielded by white-bearded old men with fancy sticks? Or just another pain in Matt Hawkins' neck? Matt knows which he would prefer, which is more likely, and that they're not the same thing. 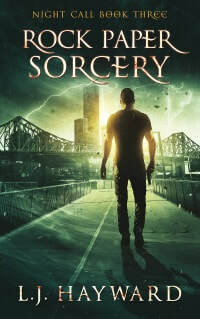 . .
Life's looking up for Brisbane's only badarse, supernatural-battling warrior. There's been a distinct lack of marauding Old World baddies and no noticeable interference from demons. Just a nice steady stream of 'small' jobs to keep Matt and the tame vampire, Mercy, in home, food and clothes. And when PI Erin McRea contracts them for a sting, Matt's happy to oblige. It is, after all, easy money. Naturally, nothing goes according to plan. Erin's mark dies in highly suspicious circumstances and Matt earns the ire of an ex-NRL player with a grudge and fists of stone. Then there's Randy Devantier--Texan, sorcerer and all round badarse. . . er, badass. Dev's looking for a rogue sorcerer, a stolen spell and a local guide. Between dodging rampaging footballers, a vampire with mood swings and a lonely PI making demands on his time, Matt has to chauffer Dev around a town that might not be big enough for two badasses on a mission. And in the middle of it all, Matt has one, burning question. How do you stop a monkey from stealing grapes out of your cereal bowl?